24 | November | 2008 | can i just finish my waffle? Desiree Rogers, a prominent Chicago businesswoman and Harvard MBA, will be named the first African American White House social secretary, sources in the presidential transition office said yesterday. Rogers, 49, is a friend of Michelle and President-elect Barack Obama’s, and a leader in Chicago corporate and civic circles; her appointment signals that the first couple consider the job crucial to how they introduce themselves to the country and the globe. She was a major fundraiser for Obama. ‘The president-elect and Mrs. Obama wanted a social secretary with extraordinary accomplishment who would bring vision and a fresh approach to the White House,’ said Stephanie Cutter, spokeswoman for the presidential transition. “Some sweet sounds comin’ down” for Citigroup last night. The feds late last night announced an unprecedented plan to rescue Citigroup by taking a $20 billion stake in the desperately troubled bank and guaranteeing as much as $306 billion worth of its toxic assets. Citigroup officials worked late into the night with a federal team led by Tim Geithner, the current president of the Federal Reserve Bank of New York. Tim Geithner is expected to be appointed President elect Obama’s treasury secretary today. 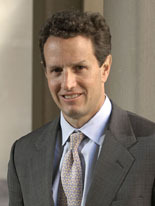 Geithner is the architect of the global bailouts of the wrecked economies of several Asian and South American countries during the early 1990s. When word was leaked Friday afternoon that he would head the Treasury Department in the Obama administration, stock markets zoomed, with the Dow Jones industrial average soaring nearly 500 points in the final hour of trading.